A machete-wielding man who cried out “Allahu Akbar” launched an attack on security forces in the area of the Louvre in the French capital, police said. The attacker, who was shot and wounded by a soldier, is now suspected of terrorist motives. The attacker tried to assault a four-man patrol of soldiers at the Carrousel du Louvre area on Friday. Early reports said he was wielding a knife and had a suitcase. Images of the apparent attacker lying on the floor by a staircase inside the Louvre are circulating on social media. There appears to be a weapon on the floor beside him. 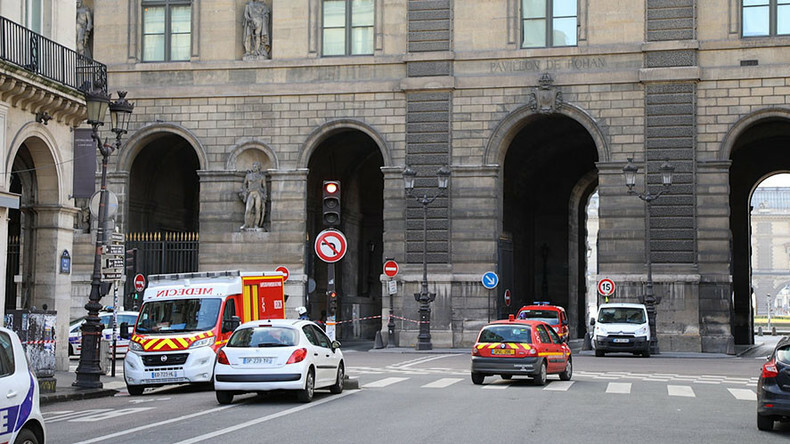 The French Interior Ministry initially reported that was a “grave public security incident” in the vicinity of the Louvre museum. The area was then sealed off. Visitors inside the world-famous museum learned of the attempted attack by loudspeaker announcement, Reuters reports. The guards directed people to sit tight together on one side of the building and away from windows, witnesses said, adding that there was no panic. There were about 1,000 visitors at the museum at the time of the incident, according to officials. Later police said there was no suitcase, but two bags, and the man carrying them on his back tried to enter museum shopping area, but was refused. Then the man tried to stab one of the soldiers with a machete, a police union official, Yves Lefebvre told AP. The attacker also cried out "Allahu Akbar," Michel Cadot, the head of the French capital's police force, told reporters. The attacker’s remarks led police to believe that he had intended to carry out a terrorist attack. "We are dealing with an attack from an individual who was clearly aggressive and represented a direct threat, and whose comments lead us to believe that he wished to carry out a terrorist incident," said Cadot. Commenting on the incident, French President Francois Hollande, who is currently in Malta attending a meeting of EU leaders, praised the efforts of the soldiers. “This operation undoubtedly prevented an attack whose terrorist nature leaves little doubt,” he said. The investigation has been handed over to the counter-terrorism section of the Paris judicial police and to the General Directorate for Internal Security (DGSI), French Interior Ministry spokesman Pierre-Henry Brandet told AP. “What is clear is that this event reminds us that the threat is particularly high and has never been this strong,” the official said. The attacker is believed to have acted alone. Two machetes have been found at the scene, according to AP. Five shots were fired at the attacker. It is understood that he sustained injuries to his legs or in the abdomen; police say they are quite serious. There have been reports of ongoing searches linked to the attempted attack in Rue de Ponthieu in Paris's 8th arrondissement. The area is some 30 minutes walk from the museum. According to initial indications, the suspected attacker is an Egyptian national, Reuters reported citing a source close to the investigation. The man arrived in France at the end of last month, the source added. 지금 루브르 앞 상황... 옆에 중국 아주머니가 하는 말이 총소리가 나고 우는 사람들이 있었다고 하네요... 또 무슨 일인 걸까요.... #파리 #또테러? #루브르박물관 #꺄루젤 #paris #louvre #attentat? A second person has been detained at the scene following suspicious behavior. The soldier who had been attacked sustained a slight scalp injury. Another soldier was reportedly wounded in the belly; Le Parisien newspaper says this is a more serious injury. The nearby Palais Royal Musee du Louvre metro station was briefly closed due to the incident, witnesses said on Twitter. The square in front of the Louvre was partially evacuated while bomb disposal officers were sent to the scene, Europe 1 radio reported. No explosives were found. The Louvre in the center of the French capital is one of the biggest tourist attractions in Paris. Soldiers patrolling the area around the museum are part of Operation Sentinelle, the massive security beef-up measure that followed terror attacks in 2015 and 2016.